QuickBooks Desktop has a feature called Auto Data Recovery (ADR) that, in a case of data loss or corruption, may allow you to recover all or nearly all of your data. ADR was introduced in QuickBooks 2012 (and later) and QuickBooks Enterprise Solutions 13.0 R4 (and later). Intuit Data Services can help with data recovery most of the time. However, the process can take some time and may mean that you cannot use QuickBooks for several days. Utilizing the ADR can be a faster way of recovering lost or corrupted data. Be reminded though that it should only be used after all appropriate troubleshooting has been tried. restoring lost transactions using your current Transaction Log file and a copy of your Company file. restoring all but the last few hours of transactions with a copy of both your Company file and your Transaction Log file. This feature is not available in Accountant Editions. The ADR file size limitation is 1.5 Gigabytes. If your backup is bigger than 1.5 Gigabytes, QuickBooks will not generate an ADR file. Follow the solutions in the order shown. Tip: You can check the location of the company file on the Product Information screen (press F2 or Ctrl+1 on your keyboard) and No Company Open Window. If you cannot identify the .tlg file, perform these to show file extensions. To open File Explorer press Windows+E on your keyboard. Select Organize, then choose Folder and search options. For Windows 10, 8.1 & 8: Choose View, then select File name extension. Copy the corresponding .tlg file of your company file, and paste it to the QBTest folder on your Desktop. Open the QuickBooksAutoDataRecovery folder. It is in the same location as your company file. Delete .adr at the end of the file. Select File > Utilities > Verify Data to check the data integrity of the recovered file. This solution will utilize the ADR version of both the .QBW and .TLG files. This should recover all but the last 12 hours of transactions. 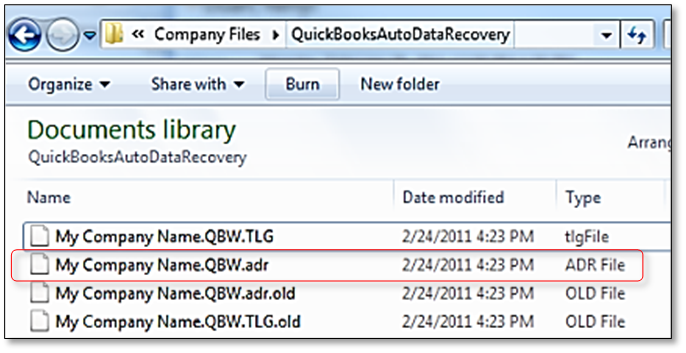 Open the folder where the company file is saved look for QuickBooksAutoDataRecovery folder. If you cannot identify the .TLG.adr and .QBW.adr files, perform these to show file extensions. Copy the .TLG.adr and .QBW.adr files and paste them to the QBTest folder. To check the data integrity of the recovered file: in the top left, select File > Utilities > Verify Data.